In September 2001, the voters of Oklahoma passed a right-to-work amendment to their state constitution by a margin of 54 percent to 46 percent, making Oklahoma the most recent state to pass a right-to-work amendment. Almost immediately after passage, several unions filed a federal lawsuit seeking to prevent the amendment’s implementation. Since a similar challenge would likely be filed in Michigan if a right-to-work amendment were ratified, the legal arguments presented in Oklahoma are discussed below. The Oklahoma amendment is reproduced in Graphic 1. A. As used in this section, “labor organization” means any organization of any kind, or agency or employee representation committee or union, that exists for the purpose, in whole or in part, of dealing with employers concerning wages, rates of pay, hours of work, other conditions of employment, or other forms of compensation. 5. Be recommended, approved, referred, or cleared by or through a labor organization. C. It shall be unlawful to deduct from the wages, earnings, or compensation of an employee any union dues, fees, assessments, or other charges to be held for, transferred to, or paid over to a labor organization unless the employee has first authorized such deduction. D. The provisions of this section shall apply to all employment contracts entered into after the effective date of this section and shall apply to any renewal or extension of any existing contract. E. Any person who directly or indirectly violates any provision of this section shall be guilty of a misdemeanor. The unions’ basic argument against the amendment was that as written, the amendment would be pre-empted in so many places by federal law that the entire constitutional provision would be invalid because it was not "severable" (a "severable" provision is one whose valid or unchallenged parts remain in force even when a court invalidates other portions of it). In particular, the unions began by contending that the amendment applied to employees that were "governed by the RLA [Railway Labor Act], the CSRA [Civil Service Reform Act], the PRA [Postal Reorganization Act], as well as those individuals employed at facilities within federal enclaves[*] in the State of Oklahoma." 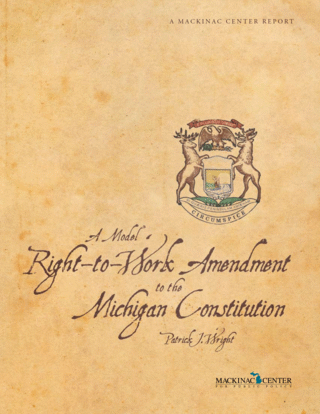 The unions claimed that none of the employees subject to those federal laws was protected by the right-to-work amendment, and they concluded that this pre-emption so radically diminished the scope of the right-to-work amendment that the entire amendment should be struck because it was nonseverable. "... [I]t is simply not a reasonable construction to extend the scope of Oklahoma’s right-to-work law to include those individuals subjected to regulation under the RLA [Railway Labor Act], the CSRA [Civil Service Reform Act], the PRA [Postal Reorganization Act], and federal enclave jurisprudence. Consequently, the court interprets Oklahoma’s right-to-work law as excluding from its coverage those individuals subject to the RLA, the CSRA, the PRA, as well as those individuals subject to federal enclave jurisdiction. From this conclusion, it follows that the preemption suggested by Plaintiffs with respect to these individuals has no application to any portion of Oklahoma’s right-to-work law." "Plaintiffs argue that under [Section 14(b),] states only have the authority to prevent employers from requiring membership in labor organizations as a condition of employment — they do not have authority to prevent employers from prohibiting union membership as a condition of employment. The court disagrees. The United States Supreme Court has upheld state right-to-work laws which prohibit discrimination in employment based on both union membership and non-membership alike. [Lincoln Federal Labor Union 19129 v. Northwestern Iron & Metal Co., 335 U.S. 525 (1949)]." "With respect to Oklahoma’s right-to-work law, it is clear that the overriding purpose of the law was to ensure that employment was not conditioned upon one’s membership in, voluntary affiliation with, or financial support of a labor organization or on a refusal to join, affiliate, or financially support a labor organization. Enforcement of the core provisions of the law which carry out this undeniable purpose is in no way hindered by the court’s invalidation of the subsidiary provisions of subsections (B)(5) [the hiring-hall provision] and (C) [the paycheck-protection provision]. Consequently, the invalid provisions of [the amendment] are severable from the core provisions and the remainder of Oklahoma’s right-to-work law is upheld." nondiscrimination provision related to those who wished to join or support a union. To properly analyze the 10th Circuit’s conclusion regarding this provision, we first need to review two seminal Supreme Court decisions that upheld right-to-work laws: Lincoln Federal Labor Union No. 19129, American Federation of Labor v. Northwestern Iron & Metal Co.; and American Federation of Labor, Arizona State Federation of Labor v. American Sash & Door Co.
† For the hiring-hall provision, see Okla. Const. art. XXIII, § 1A (B)(5); for the paycheck- protection provision, see Okla. Const. art. XXIII, § 1A (C).